This past week was pretty cool. (Elder Payne’s sister had her son recently.) When Lacey gave birth on monday i was preparing to give birth to my son on wednesday haha. He was born around Five in the morning haha. But because we had to wait for his bus to come in, that meant we didnt get to see our area until late wednesday afternoon. But ever since then we have been working hard trying to find more people to teach and to teach our lessons with Gods power. Its amazing how awesome things turn out when you rely on the Lord. I really think now that, the reason why he gives us trials and experiences is because he wants us to become closer to him. But again its our choice whether or not we choose to find the embrace that he can so lovingly give us. And i think now the Lord wants me to become close to him. I know its a little bit weird but im grateful for the trials he has given me because they keep me close to him. I was also talking this past week with one of the seniour couples and the discussion came up to how long i have been serving in ThabaNchu and also the Bloemfontein area. When i told them their jaws almost hit the floor haha. I mentioned to them something that another missionary told me a while ago which was “just know if you are staying in an area for a long time then you are doing something wrong.” As i said this The sister told me “Well you know Elder Payne i dont think that is true. If a missionary was doing something wrong then the Lord would move him right out of that area. I think why you have been here so long is because you are doing something right and continue to do the right thing!” After that i felt a lot better about staying here and continuing to do The Lords Work here. I know what we as Missionaries do is sacred work meant for angels. But for some reason he called us imperfect mortals to do his holy and divine work. 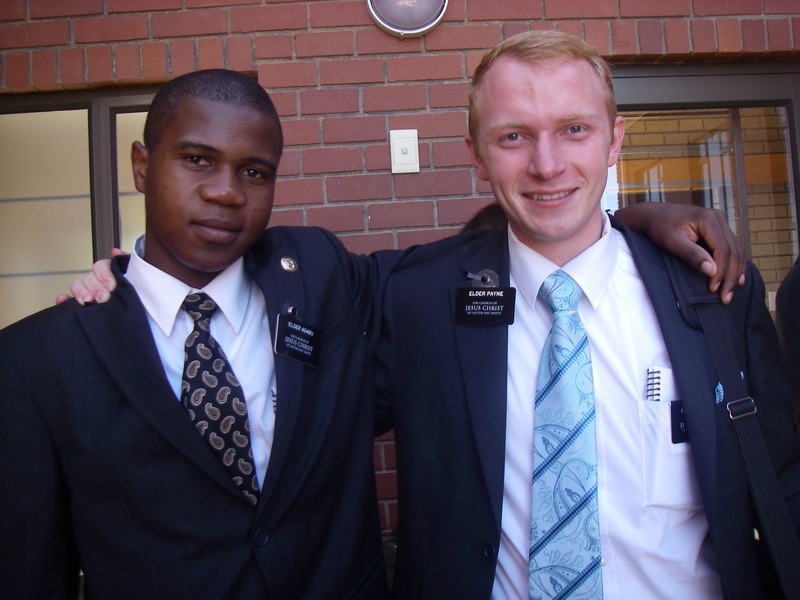 Elder Payne and his greenie, Elder Agabu! Previous PostTraining a new missionary!Next PostZone Conference… surprise!